Dislocation of the proximal tibiofibular joint occurs most commonly when the athlete sustains an impact or falls with their knee in a fully bent position. It is an injury to the joint at the top of the shin where the two shin bones meet at the knee. Symptoms include pain and swelling on the outer surface of the shin. The head of the fibula bone may become more prominent just below the outer surface of the knee. Moving the ankle increases the pain in the knee. The patient may be unable to weight-bear. 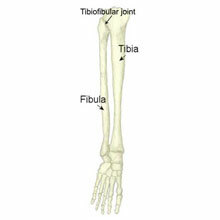 The tibiofibular joint is a relatively immobile structure that joins the two shin bones; the fibula (outer) and the tibia (inner). It is separated into two parts, the proximal or upper joint just below the knee and the distal joint which lies above the ankle joint. Their function is to limit the movement between the two shin bones caused in particular by twisting movements of the leg. It is composed of strong ligamentous bands that pass diagonally between the tibia and the fibula bones. Dislocation of the proximal tibiofibular joint occurs most commonly when the athlete sustains an impact or falls with their knee in a fully flexed position, with their foot pointing inwards (inversion) and downwards. This puts added strain on the muscles which connect the fibula to the foot and toes such as the peroneal muscles. In this position, the fibula is pulled forwards and if the force is sufficient it may cause the joint to become dislocated. This injury should be treated quite seriously as it may sometimes be associated with injury to the peroneal nerve. A Tibio-Fibular joint dislocation is different from a whole knee joint dislocation – where the thigh bone (Femur) and the Tibia become separated. This is known as a Tibio-Femoral joint. Rest and apply cold therapy as soon as possible. Avoid aggravating movements i.e. full flexion of the knee, inversion of the ankle. See a sports injury specialist immediately. A sports injury practitioner can correctly diagnose the injury and advise on pain relief such as NSAID’s e.g. Ibuprofen. Dislocations arising from trauma are normally treated surgically where the aim is to fix the two bones back together. This may be achieved by inserting screws or a k-wire to keep the two bones in place. Following surgery, the leg is normally immobilized in a cast for up to 6 weeks. Once the cast has been removed a rehabilitative exercise program should be maintained to aid full recovery.